10. Pen drive of all the cases videos including lectures and the photographs of the workshop. 1. All inclusive taxes and above inclusions are $3000 USD dollars for 10 nights stay inclusive (25th Jan to 3rd Feb ). 2. $3200 USD dollars all inclusive for Lap Extended to 14 Nights ( 25th Jan to 8th Feb ). 3. $4200 USD dollars all inclusive for lap 10 days + 1-week IVF course. 4. Only 1 week IVF course - $650 USD dollars. 5. Only 2 weeks IVF course - $1200 USD dollars. 6. 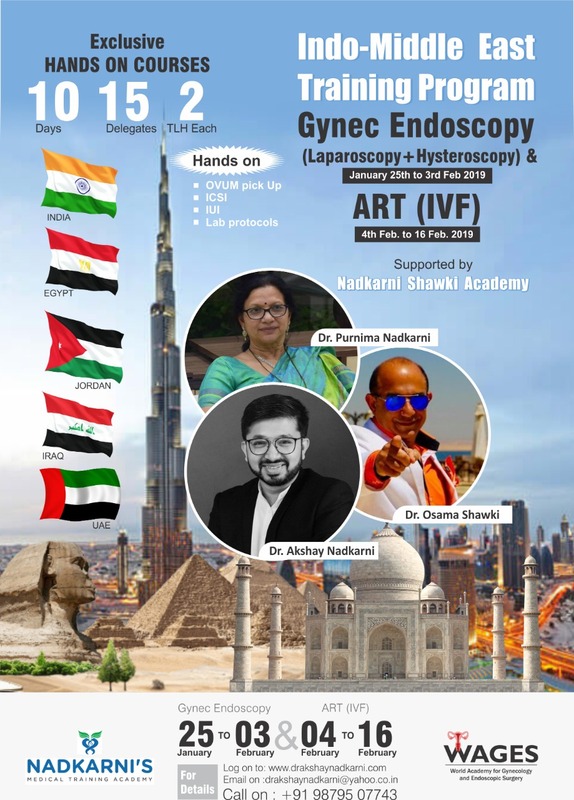 Extendable 1-week ivf course offer available from 4th Feb to 10th Feb 2019 on add on $1000 USD dollars registration fees. Advance registration charges of 200 USD to be paid to confirm the seat. pending aount can be paid in cash on arrival. The receipt of the amount transfer to be emailed or can be sent on facebook message. - Options of FOGSI Recognised course available. 3. Laparoscopy + IVF combo. - Charges: Rs. 1.5 lakhs inclusive stay in a hostel and above inclusions. - Hands-on pickups on patients. Indian delegates need to pay 50% advance to confirm the seat. Advance to be paid at least 1 week before arrival. Receipt of amount transfer can be sent via email or facebook. Nadkarni Hospital & Test Tube Baby Center, Char Rasta, N.H.#8, Killa Pardi-396125, Dist Valsad, Gujarat.